BUT, it is GOOOOOD! Like really good. Thanks to the best husband on the planet. 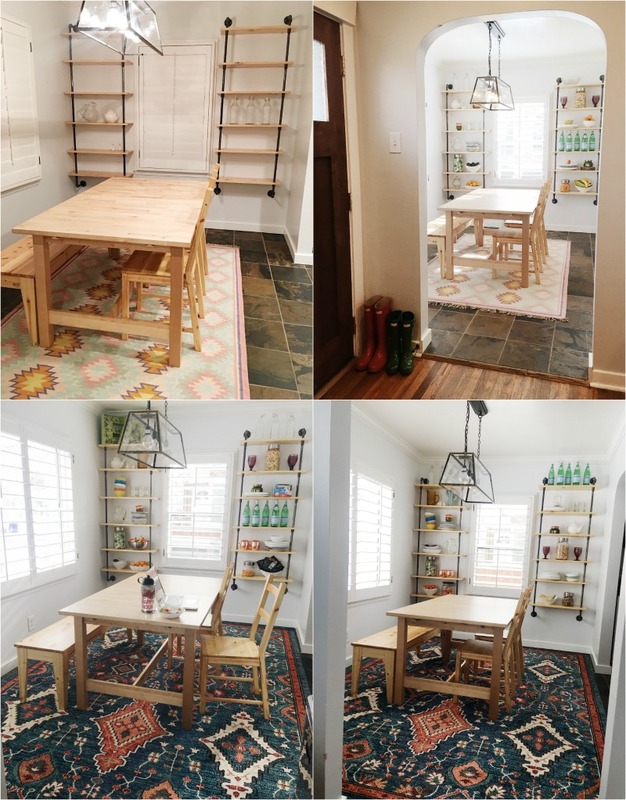 I took the before and after pics and blah blah blah but he did the shelving unit and made this post so legit and easy and perfect for alllll your DIY needs. 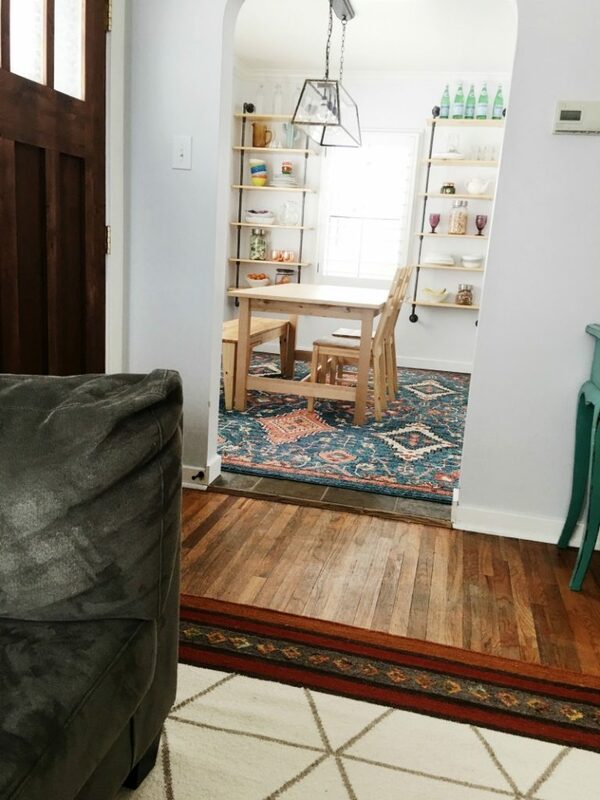 You can see by the pictures, it’s amazing what a little paint can do to a space. Well paint, a light fixture from a neighbors garage (I love you forever Jensen family), and some plumbing pipe. Scroll through some of the transformation pictures and then feast your eyes on the husbands tutorial, complete with pictures with text and lines and all the bells and whistles. 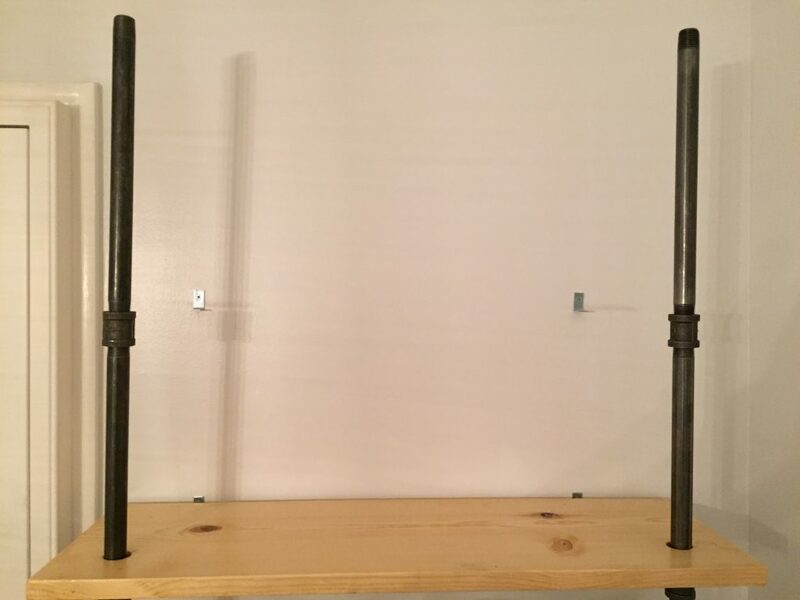 The following post is a Tutorial on how to build the Plumbing Pipe Shelves. This cost us around $350. We were able to purchase everything at Home Depot. 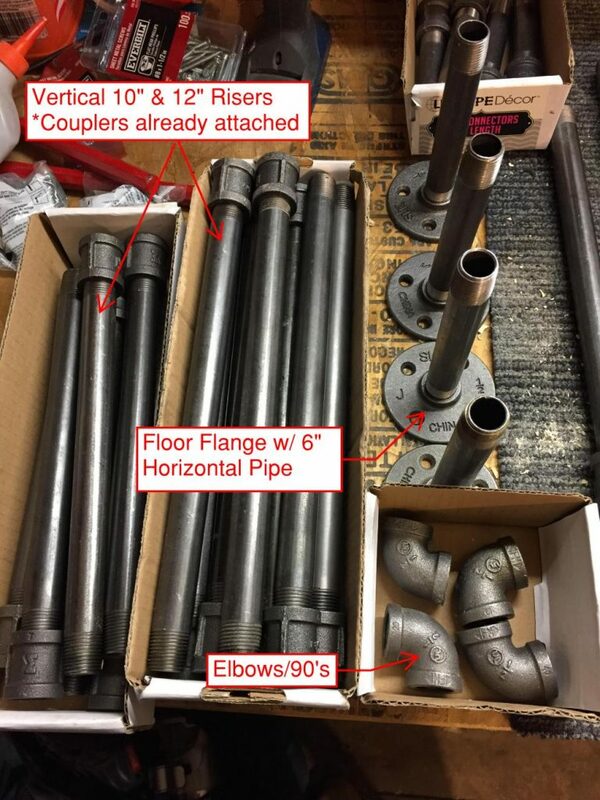 Home Depot has a section dedicated to Plumbing Pipe Projects. You may need to get additional parts from the actual plumbing section. 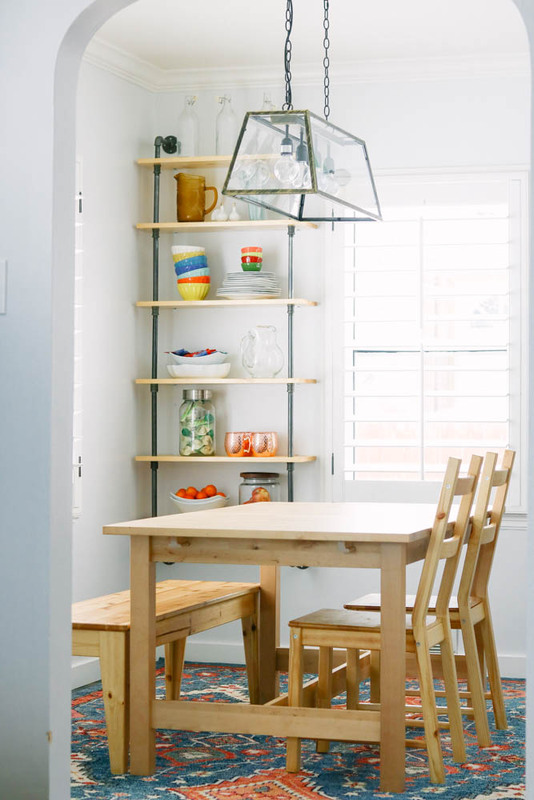 We had a window in the center of a wall and we wanted to install shelves on either side of the window to store our plates and decorations. We went ahead and measured the space and determined that we had enough for 6 shelves for each side. We also wanted to make it unique by alternating the spacing between the shelves. 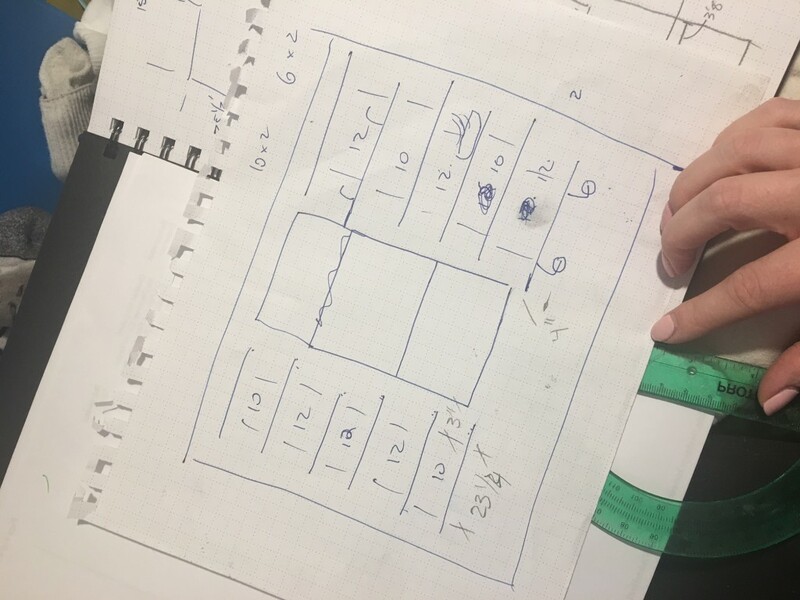 Here is an image of our sketch from measuring our space and a final sketch I’ve put together for you to make sense of our sketch. 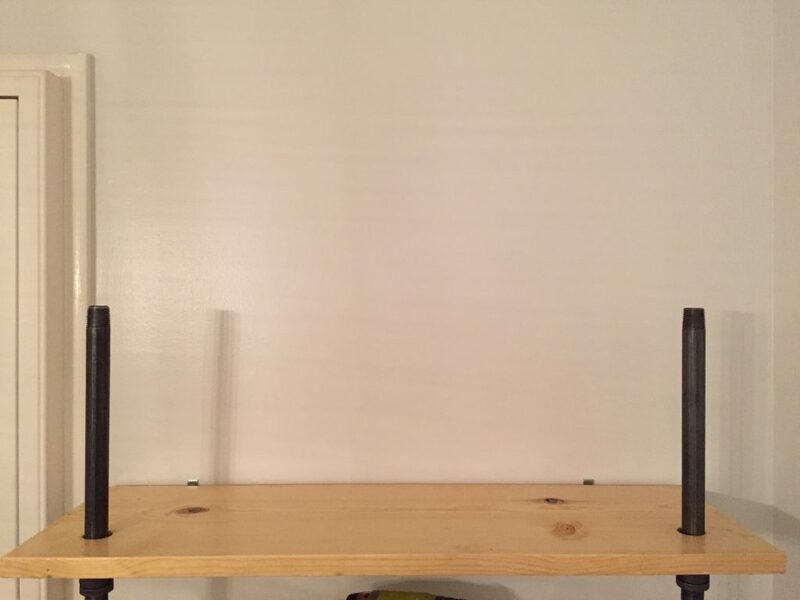 We determined that our shelves would be 24″ wide and the full height from bottom shelf to top shelf would be approximately 5′. Once you’ve decided on your design I recommend drawing it out on paper so you can make sure you get all the right fittings and pieces. PLUMBING PIPE: There are two different types of plumbing pipe you can get. Black Pipe – We built ours out of black pipe. The pipe will be Black and will need to be cleaned before you assemble it. The pipe has a film of grease on it from the manufacturing plant. Pipe (these come in all sorts of lengths) We used a 6″ short piece for the horizontal section that came out of the floor flange. The rest were 10″ or 12″ vertical pieces. STAIN: We went with a Clear Polyurethane Stain. We love this stuff because the stain has the Polyurethane already in it. The polyurethane will prevent moisture from entering the wood and it gives it a protective coating. A regular stain still leaves the raw wood exposed, all your doing is changing the color of the wood with regular stain. The following picture shows all the Plumbing Pipe half way assembled. We connected all the Couplers with the vertical riser and the floor flanges with the 6″ horizontal piece. WALL HANGERS: You’ll see pictures of these little guys later on. 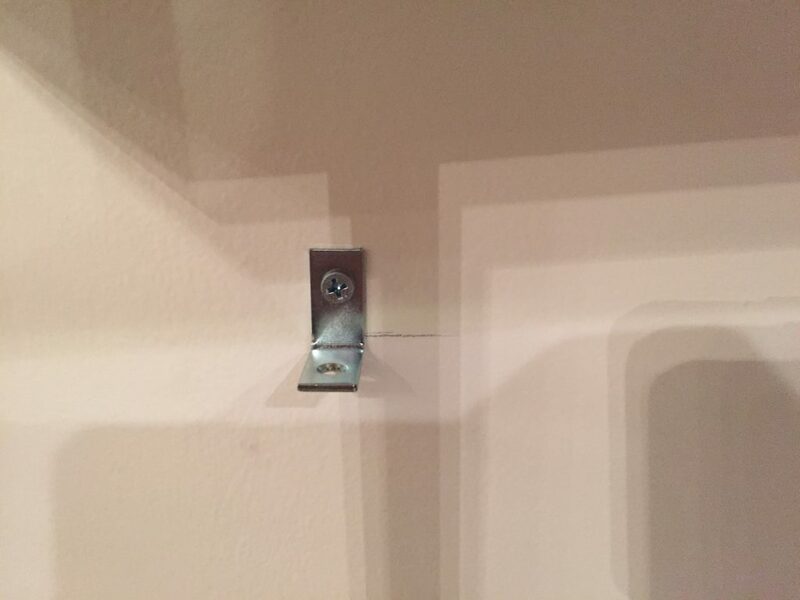 But they are simple little 1″x1″ metal angles that mount to the wall and the back side of the shelf will rest on. Don’t forget the screws for these. 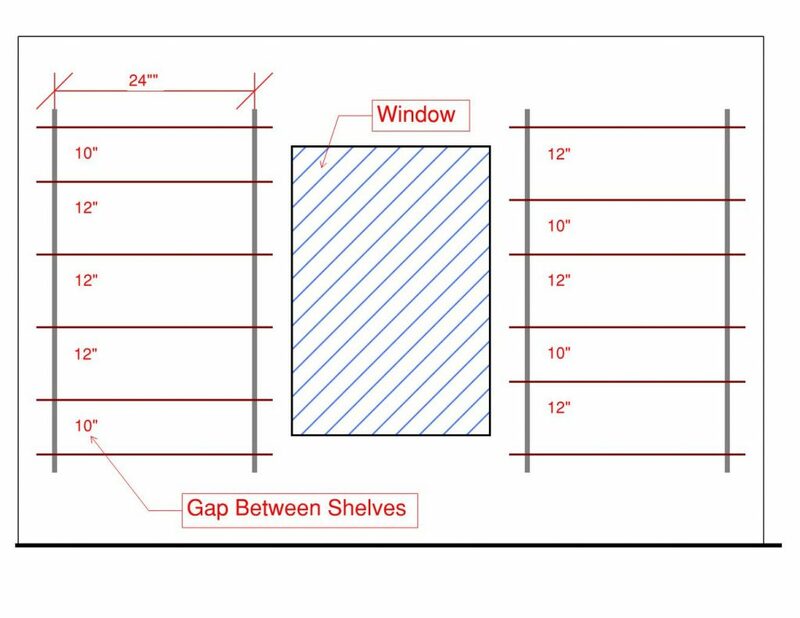 Start by measuring your shelves and cut away. 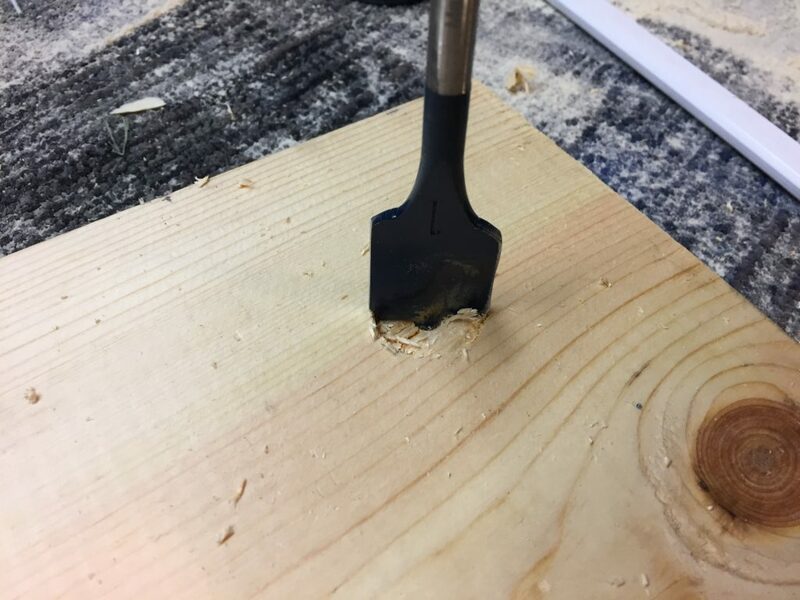 I used a ‘square’ to make sure my edges were straight when I cut them with the skill saw. Once they are cut then drill your holes for the vertical risers. Don’t drill the hole to big or the coupler will slide through the hole and everything will be a waste. 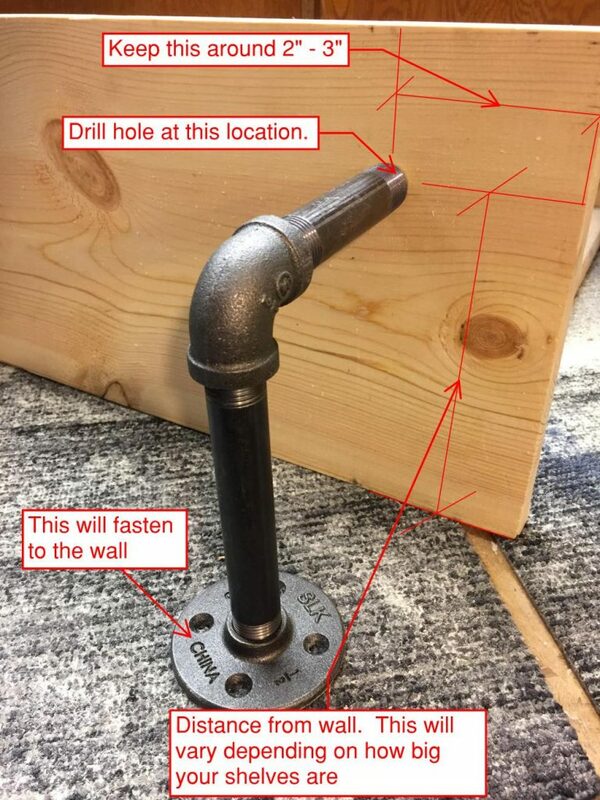 The best way to get the location of the hole is to assemble the Floor Flange with the Horizontal Pipe, 90° Elbow, and Short 4″ riser. See the picture below to reference how I got my layout. 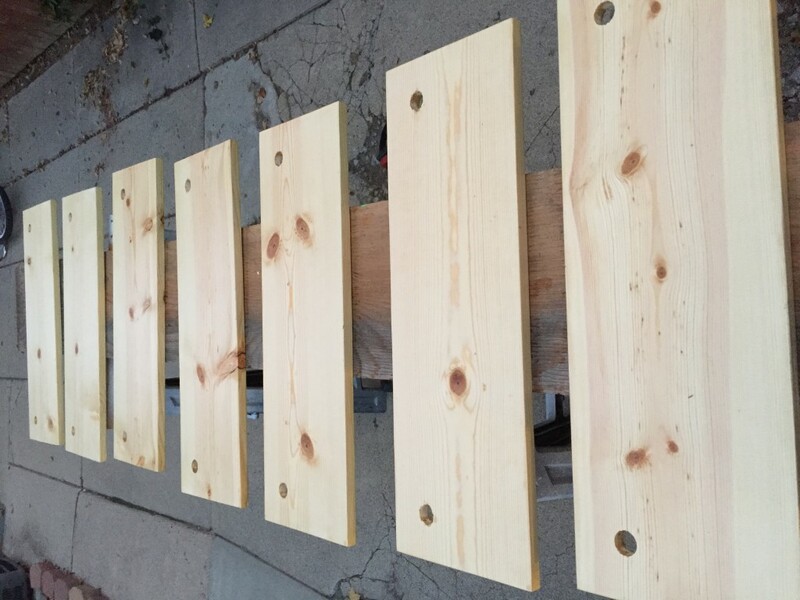 Once you’ve drilled the holes you can go ahead and sand each shelf. Make sure to get each side and edge. Once you’ve sanded everything you are now ready to stain. After the first coat, take a light (200+ grit) sand paper and lightly sand the shelves. This will smooth out any bubbles from the polyurethane stain. The instructions recommend this step and so do I. It takes time but your shelves will be smooth. After you’ve lightly sanded each shelf you can then apply the last coat. TIP: make sure to check below each self for any runs from excess stain. 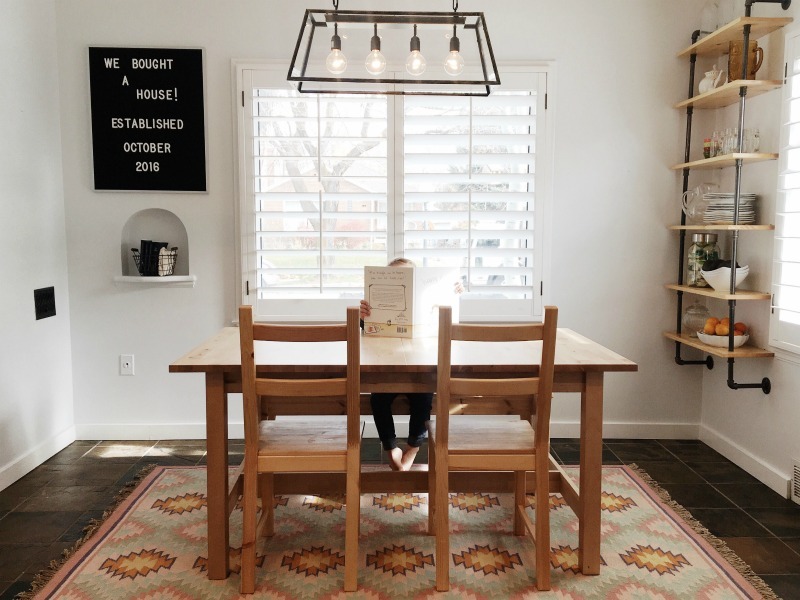 Start by installing your floor flanges on the wall. Make sure they are level by screwing in the short horizontal piece and resting the level on top of the short horizontal pieces. DISCLAIMER: Plumbing pipe is not manufactured perfect and not every fitting and pipe piece is the exact same. You may need to screw on couplers more or less than others to adjust the height of each shelf section. Once your floor flanges are installed you can now install the 90° elbows and start installing the vertical risers with the couplers. 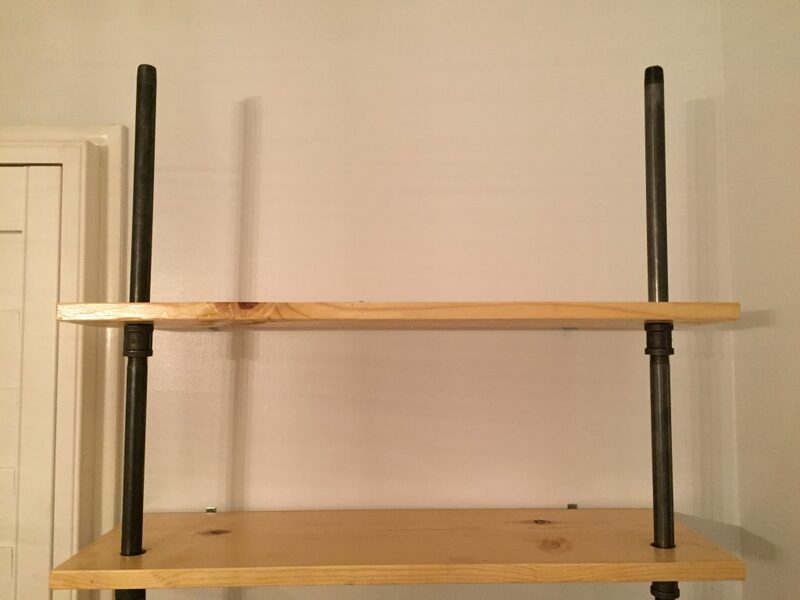 We started out with a short 4″ riser at the bottom for our first shelf. For each shelf you’ll need to rest the shelf on top of the couplers and check it levelness horizontally both directions. Make sure its not tilting to the side or its not tilting back toward the wall. 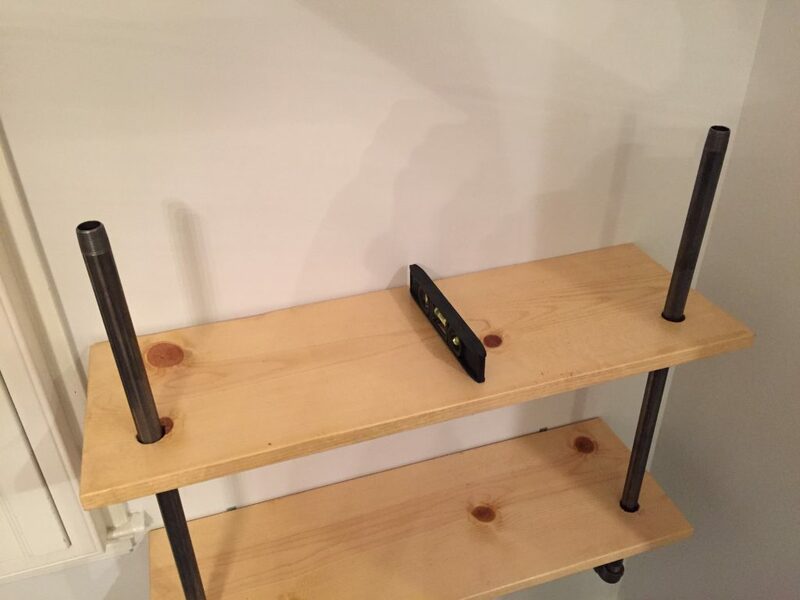 The shelf needs to be flat. 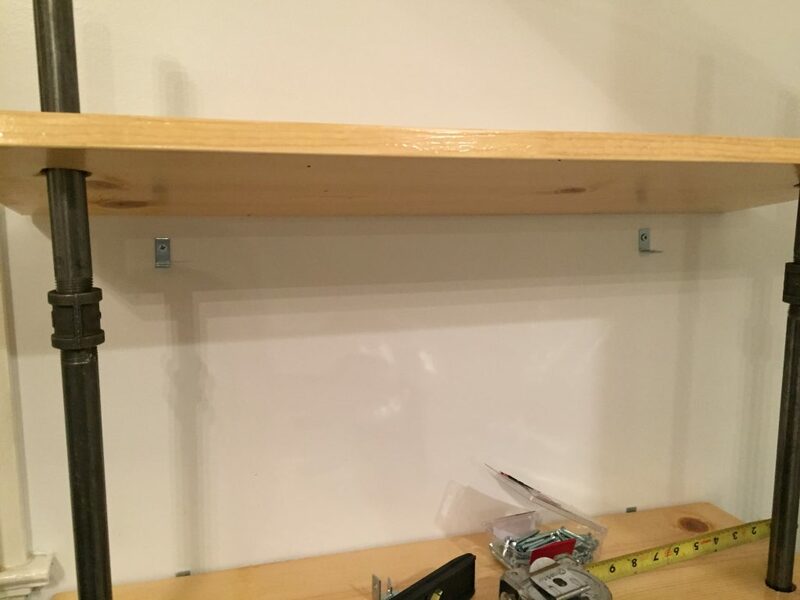 Once you’ve finalized the levelness of the shelf you’ll need to mark the bottom of the shelf against the back of the wall so you can install the metal angles that will support the back of the shelf. 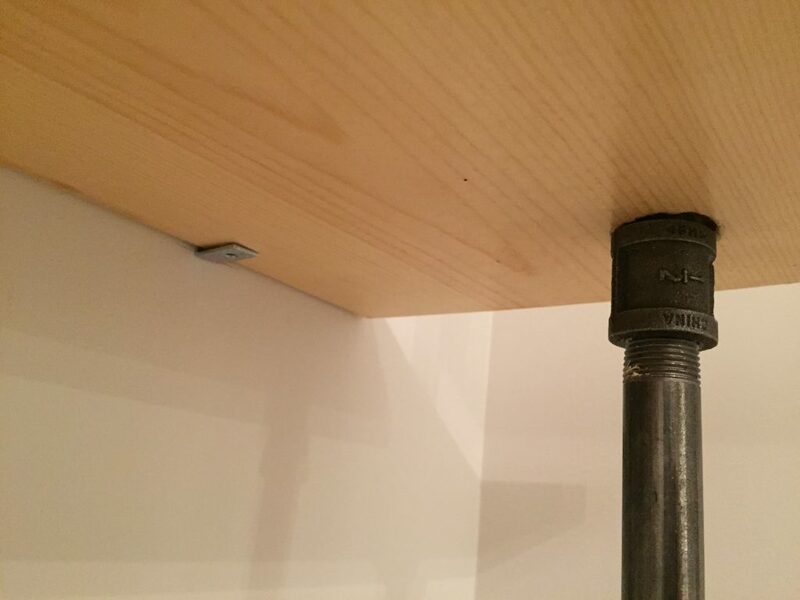 Once your shelf is fully complete you’ll want to go back and install some little screw at the bottom of the metal angles into the shelves to hole the shelves against the wall. Now repeat the steps above until you reach the top where you’ll finish by installing the floor flanges. Reference the following pictures for the installation process for a shelf. That’s it dudes. And then you get to decorate decorate decorate. And switch and change those decorations over and over and over. « Happy 40th to my angel sister!